Sometimes when you lose a tooth, either through trauma or if it has to be extracted due to excessive decay, it’s tempting to save a few dollars and leave the gap. That’s a bad idea for a variety of oral health reasons. A better idea is to replace that missing tooth with a dental implant. 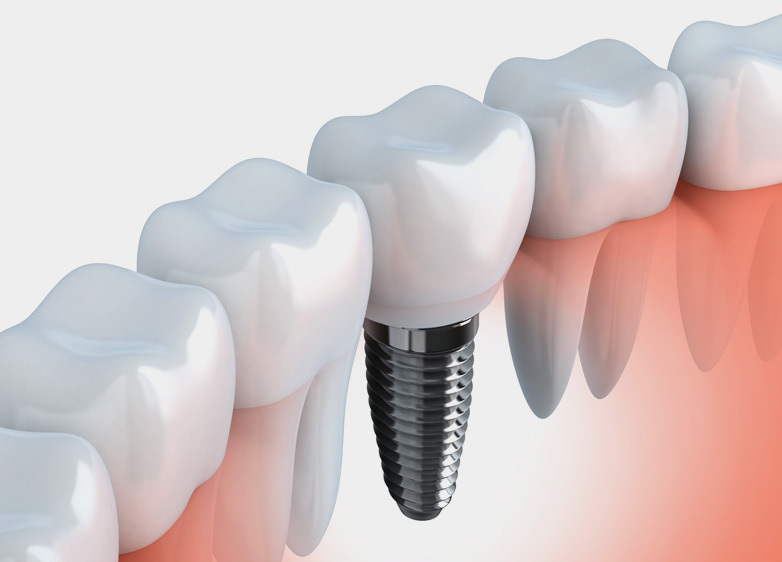 Dental implants are the best replacement for a missing tooth or teeth. Dr. Sorensen places implants at Blue Water Dental of St. Johns. A dental implant is named for its base. The base is a titanium prostheses shaped like a screw. It is screwed down into the hole formerly occupied by the natural tooth root. The human body accepts titanium, so the jawbone then grows around the implant, making it a part of the jaw. A post is placed into the implant and an artificial tooth is attached to the post. Because they are anchored into your jaw, just like natural teeth, dental implants function and feel just like natural teeth. Whate Are The Advantages Of Having A Dental Implant? Dr. Sorensen believes dental implants to be the best tooth replacement option. Here’s why. Because they are anchored into your jawbone, dental implants function exactly like a natural tooth, so the patient can eat any foods and chew normally. Implants are “stand alone” restorations. This contrasts with bridges, which require crowns on the adjacent healthy teeth to provide anchors for the bridge that replaces the missing tooth or teeth. Implants keep adjacent teeth in place, maintaining your alignment. Implants are load-bearing teeth, so you don’t have to avoid chewing or biting with them. Plus, they transfer energy down into the jawbone just as natural teeth do. They help keep your jawbone healthy and regenerating. Implants have a 90 to 95% success rate and can last for decades, giving the patient back his or her smile and the ability to eat any foods. It’s not a good idea to leave the gap created by a missing tooth. Teeth stay in place thanks to the pressure placed on them by the adjacent teeth. Without the pressure, the teeth tend to slide over into a gap created by a missing tooth. This creates problems with your alignment and bite, which can lead to irregular tooth wear and TMJ. You don’t think about this, but chewing and biting involve a great deal of bite force energy. This energy is transferred through the tooth down into the jawbone, stimulating the jawbone to continually regenerate new bone mass. This is key to a healthy, strong, jawbone. Without that energy coming down through the tooth, the jawbone in that area begins to deteriorate and resorb. This is why people missing many teeth sometimes appear as if their face is collapsing backwards. Missing teeth are visually embarrassing. They can create whistling gaps when pronouncing certain words. And missing molars can create problems with chewing, making the person avoid certain foods, which can cause nutritional deficiencies. Would I Be A Good Candidate For A Dental Implant? The determining factor with dental implants is jawbone mass and density. If you’ve been missing a tooth or a couple of teeth for a period of time, you may have lost some jawbone beneath those gaps. If that’s the case, your jawbone may not be sufficient to support the titanium implant. That doesn’t mean you can’t have an implant, but Dr. Sorensen will have to rebuild some jawbone mass first through bone grafting. Otherwise, as long as your gums are healthy, most people of all ages are good candidates for implants. Will My Implant Look Fake? The false tooth that is attached to the implant is made from dental porcelain, which has a very similar translucence to natural tooth enamel. Plus, the color is precisely matched to the color of your surrounding natural teeth. Once your implant is in place no one will know it’s not one of your natural teeth. Getting a dental implant with Blue Water Dental isn’t an overnight procedure. It involves a series of steps, followed by some time in between. Consultation: The implant process begins with a consultation with Dr. Sorensen, who performs a full oral exam and takes x-rays and a CT scan to determine your jawbone mass. Placement: Next the titanium implant is placed into hole formerly occupied by the tooth root. Dr. Sorensen may have to drill a small hole into the jawbone to prepare it. The implant is shaped like a screw and is inserted in that fashion. Osseointegration: Now the patient simply waits three to six months as the jawbone naturally grows around and accepts the titanium implant. Abutment: When the jawbone has fully grown around the implant, a small metal post, called an abutment, is attached to the implant and the gum tissue is allowed to heal for around six weeks. Are There Risks To Getting Dental Implants? Dental implants have a 90-95% success rate. There is very little risk and few complications. You have a slight risk of infection when the implant is placed, but diligent cleaning minimizes this. Overall, the implant process is one of the most effective and reliable dental treatments. Dental implants are remarkably strong and durable. Plus, since the implant base is anchored into your jawbone, it’s basically like having a new tooth. Dental implants will last for decades, often for the remainder of the patient’s life. Also, if for some reason the false tooth breaks, it is easy to simply make a new false tooth and attach it to the same implant base. Blue Water Dental of St. Johns proudly provide patients from Ponte Vedra, Palm Valley, Jacksonville, and Nocate, FL and surrounding areas with Dental Implants. Contact us at (904) 395-7771 or Request An Appointment today.